Santa Monica is one of the best places in California to enjoy both a lively beach scene and a city atmosphere all within a few minutes' ​walk of each other. In fact, National Geographic calls it one of the top 10 beach cities in the world, ranking it among places like Honolulu and Rio de Janeiro. You may want to go to Santa Monica just because you've heard so much about it. In that case, you're ready to browse the things you can do and pick a place to stay. You will also like Santa Monica if you want to spend the day at the beach and the evening at a good restaurant. Its thriving arts scene may also be appealing. Hotels are on the expensive side, but you'll find plenty of moderately-priced places to eat downtown. 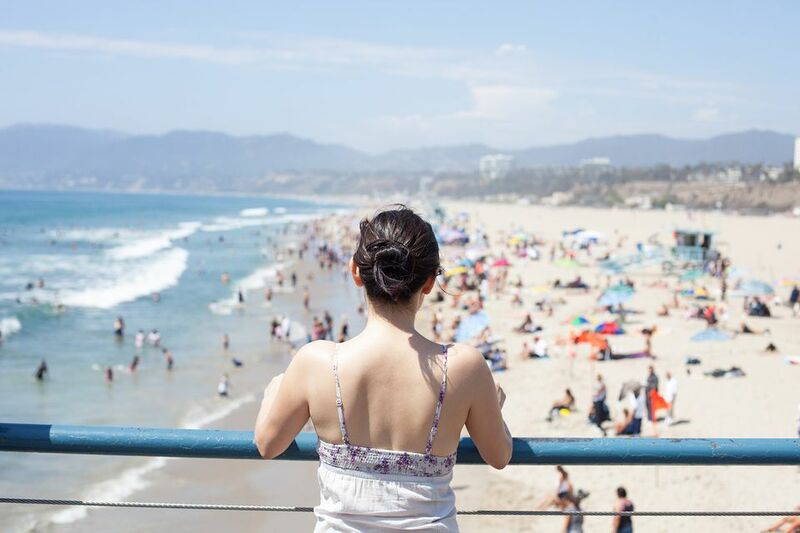 The most popular time to go to Santa Monica is summer, but the beach can get so crowded on summer weekends that you might have a hard time seeing the sand from all the people standing on it. May and June are also prone to gloomy, foggy days when the sun never shines. That happens so often that it has a name: "May Gray" and " June Gloom." Santa Monica weather is best in spring and fall, and in winter as long as it isn't raining. If your idea of a romantic getaway involves walking hand in hand on the beach at sunset, having a meal at a restaurant, or staying in a hotel room with an ocean view, Santa Monica is a great place to visit. Millions of visitors go to Santa Monica every year. Most of them are day-trippers, but some stay overnight. No matter how long you plan to spend there, you'll want some ideas on how to spend your time. If you look at photos of Santa Monica online, you could easily conclude that the beach and pier are the only things in town. This short list of things to do near the ocean includes the places people go most often. Santa Monica Pier and Pacific Park: Santa Monica Pier is the home to one of the few remaining oceanfront amusement parks. It's also LA's only admission free amusement park. Go in the late afternoon to watch the sunset and stay to see the lighted rides at night. Santa Monica Beach: The beach at Santa Monica is big—3 miles long and covering 245 acres of sand—and it has great views. It can be crowded near the pier, but you'll have more space to spread out just a short walk away from it. Beachfront Pathway: The paved, level beachfront pathway runs all the way from Will Rogers State Park north of Santa Monica to Redondo Beach, a trip of about 25 miles one way. The pathway passes through Venice Beach and runs past the end of the LAX runway, where you can watch airplanes taking off overhead. You can walk on it, run on it, or bike on it. If you left your wheels at home, Santa Monica Beach Bike Rentals is well rated. Palisades Park: The narrow sliver of land between Ocean Avenue and the cliffs' edge is actually a city park. It's a great place for a walk or a run, and if you like unusual things, check out the Camera Obscura at 1450 Ocean. It's an optical device built in 1899 that brings the outside scene inside in an interesting way. Santa Monica Farmers Markets: Not only do these outdoor markets have things you could take home to cook, but you'll also find stands selling things you can eat on the spot. On Wednesday and Saturday mornings, the market is on Arizona Avenue between Second and Third Street; on Sunday, it's at 2640 Main Street. Museum of Flying: If you're into aviation history, this one is for you. Founded as the Douglas Museum by Donald Douglas Jr., it focuses on Southern California's aviation industry and has several interesting aircraft on display. Trapeze School: If you ever wanted to run away and join the circus, or if you just like the idea of flying around through the air, you might want to take a lesson here. Take a Surfing Lesson: Just search online for "Santa Monica surfing lessons," and you'll come up with dozens of companies willing to teach you. Glow Arts Festival: This exciting event is kind of like Burning Man on the beach. Held in September, but only once every few years. Twilight Concerts at the Pier: Free concerts that take place between July and September. Most kids love to play at the beach, and the whole family can go for a bike ride on the paved, long, flat oceanfront path. From a distance, all the rides at Pacific Park on the Santa Monica Pier look like they're designed for bigger kids, but you'll also find a lot of smaller, fun ones for the little guys. While you're on the pier, check out the kid-friendly aquarium, too. If the kids need to work off some excess energy, try the playground at Tongva Park. It's located just across the street from the entrance to the pier and the very cool play area is in the back corner. Adventurous youngsters might also enjoy the Trapeze School or surfing lessons, mentioned above. Third Street Promenade: You'll hear a lot of hype about this pedestrian-only shopping area. Lots of people give high ratings in online reviews, but if you live in a place that already has a lot of mid-range chain stores, you may find it a bit ho-hum. Santa Monica Place: This open-air shopping mall's stores include Bloomingdale's and Nordstrom. Montana Avenue: It's my top pick if you're looking for something more interesting and unique than the chain shops on Third Street. You'll find more than 100 high-end boutiques and places to eat along the 10-block stretch. It's easy to start your exploration at Montana and Lincoln. Santa Monica Airport Flea Market: This outdoor market is held on the first and fourth Sunday of each month. It's said that you can furnish an entire house in one visit to this massive market. You can also deck yourself out with estate jewelry and vintage fashion, or get something new for your garden. Santa Monica Design District: This area has lots of showrooms dedicated to modern home and workplace furnishings and design. Bergamot: It doesn't look like much from the street, but once you get inside, you'll find more than 30 art galleries featuring some interesting contemporary art. You may go thinking you'll spend a few minutes and end up wandering around for hours. It's a good thing they have a place to eat on site. Santa Monica is a good place for any architecture junkie to see an interesting mix of styles and eras. Charles Eames House: One of about two dozen homes built as part of the Case Study Project in the 1950s, created by Charles and Ray Eames as an example of a home for two working artists. It's a little north of Santa Monica proper in Pacific Palisades. Art Deco Hotels: If you love art deco style, the Georgian and Shangri-La hotels are great examples of the style. Frank Gehry Residence: Did you know that Frank Gehry's deconstructionist Santa Monica home played a big part in his career direction? Julia Morgan: The property that is now the Annenberg Beach House once was the home of actress Marion Davies, William Randolph Hearst's longtime girlfriend. The former guest house (which is part of a much larger property designed by Morgan) is open for docent tours. If you're in Santa Monica long enough to think you want to explore a little further, you can take day trips to nearby areas like Malibu, Marina Del Rey, or Venice Beach. Alternatively, you can take a road trip on the Pacific Coast Highway and enjoy the views. Even though Santa Monica is a beach city, don't expect every hotel to be right on the beach. In fact, hotels that appear to be just across the road from the beach may be on a bluff above it. Finding an affordable, nice place can also be a challenge, but there's no need to worry. Santa Monica is in Los Angeles County and the nearest airport is LAX. It's about 20 miles west of downtown LA, which is a 30 minute-plus drive, depending on traffic. It can be extremely hard to find parking in Santa Monica due to the proximity of the downtown shopping area, the beach, and pier, and it's even more difficult to find free parking. According to the City of Santa Monica website, 80% of hotel visitors do not use a car once they arrive in Santa Monica. Think about joining them and taking public transportation if you can. The ​LA Metro Expo Line began operating between downtown LA and Santa Monica in 2015.